I have a usb nerdkit connected to my ibook g3. 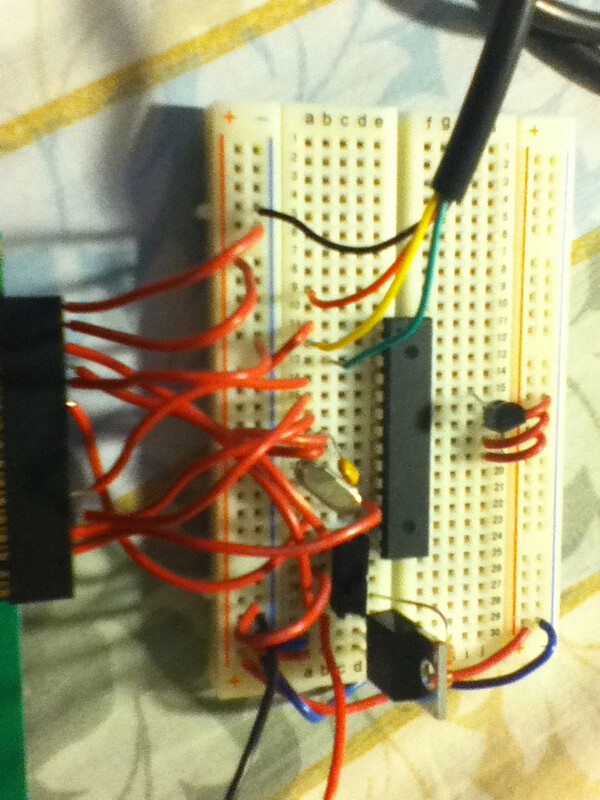 When I created the basic circuit and hooked it up to power 2 lines lit up on the lcd. I thought "this is odd" so I rewired it and it still had the 2 black lines. When I connected it to my computer and tried to run makefile in terminal it said can't reach programmer. Two black lines on the LCD is what you will see when the display is not initialized. Did you get the welcome message prior to attempting to program? Were you ever successful (at least partially) in transferring a program? While I'm not a MAC guy, this could be hardware related. A good overhead photo of your setup so we can better see the wiring on the board could help. I never got the welcome message. I will provide a picture after breakfast. The program never successfully transfered, or partially, as far as I know. Here's the pic. I took it with my iPod Touch. I wired it up again, and after some problems with a loose wire, I got it to display the message. I also added an on off swithc with the dpst switch. and none of these things have to do with usb. Neither of them can get a program onto the chip. When I throw the programming switch, the two black lines are back. Is this supposed to happen? I can get the error messages if anyone who can help wants them. You will get the two black lines when in program mode because the bootloader does not use the LCD. As such, the LCD isn't initiallized. As for your programming cable not showing up on your MAC, that's something one of the MAC people will have to help out with. I'm a PC guy. I'm glad you did get your wiring situation resolved though. I do not believe you USB driver is installed. If your iBook G3 is running Lion there have been reported chalenges, but it is working for persistant people. There is a link to a newer driver in the Nerdkits Community Library. I posted that link a while ago so there might even be newer drivers. I can tell you are not a macintosh person. Lion requres an intel processor (Like in windows computers). Macintosh computers from before 2005 have a power pc processor ( Made by motorola). My iBook runs Mac OS 10.4.11, the maximum possible on a G3 Power PC processor. My Mac Mini runs Lion. I went to the page for the lion drivers and I what appears to be a japanese 404 (page not found) error message. I also have an ubuntu computer, but I have problems with the command prompt. and could not figure out how to access the code folder on my desktop. I don't know if the link will work or not, but HERE IS A LINK to the updated driver page at prolific.com. BTW, as I stated earlier, I'm not a MAC guy, but a quick web search turned up this. I hope it works for you. One last thing, you didn't have to show disrespect to Ralph by stating "I can tell your not a macintosh person". He has been a longstanding upright member of this community who has gone out of his way to try to help people struggling with getting their Nerdkits running. He has helped many a Mac user with drivers. I'm also sure he didn't realize the link was dead. I know for a fact he does at the very least own a Mac mini and had troubles getting things working with it. That is why he has tried to help other Mac users when they struggle. While he may not have realized your PPC MAC can't run Lion, that doesn't mean that the info he was trying to provide wasn't an honest attempt to help you. While you may not have meant disrespect, the way you phrased your post came off that way to me. We try to be a helpful friendly group here. Occasionally we say things we regret but try to correct ourselves when we do. You WON'T see big flame wars here. Just remember, the way things are said to long time members of a forum can be the difference between getting help and not getting help sometimes. I normally give people a few chances because I know intent can be misinterpreted in type. I am sorry. I also thought that he was the guy who said: "While I'm not a MAC guy,". I wasn't really paying attention to usernames. Thank you. I will let you know if the driver works. No problem, that's why I said intent can be misinterpreted with text on a forum. I'm glad to know that was the case this time, and your explanation makes perfect sense. Hopefully the driver will work for you. By the way, did the link to prolific's site work or did you have to download my mirror? I had to login to their site to get to the page I linked, so I wasn't sure if a direct link would bypass the login or not. I had to use the mirror. I am currently installing. There is no new cu. files. If you have any other suggestions, I am open to them. If you think another computer would work better, my website contains a list of my computers. If the toshiba laptop still has windows on it, you might try winavr on that. Otherwise, your newest mac mini or the ubuntu pc might be the best options.